Skillet and potatoes just go together. Well, if you ask me, any food made in a skillet tastes so much better. This dish is so simple, and I always have to make a double batch because my family cannot have enough of these potatoes when I roast them. They go so well with any meat or fish. Usually, I serve them with grilled chicken and mixed greens salad. Also, if you by any chance have leftovers, these potatoes make an amazing potato salad. There is nothing more satisfying than placing a roasted potato in your mouth… it’s like a burst of flavor. 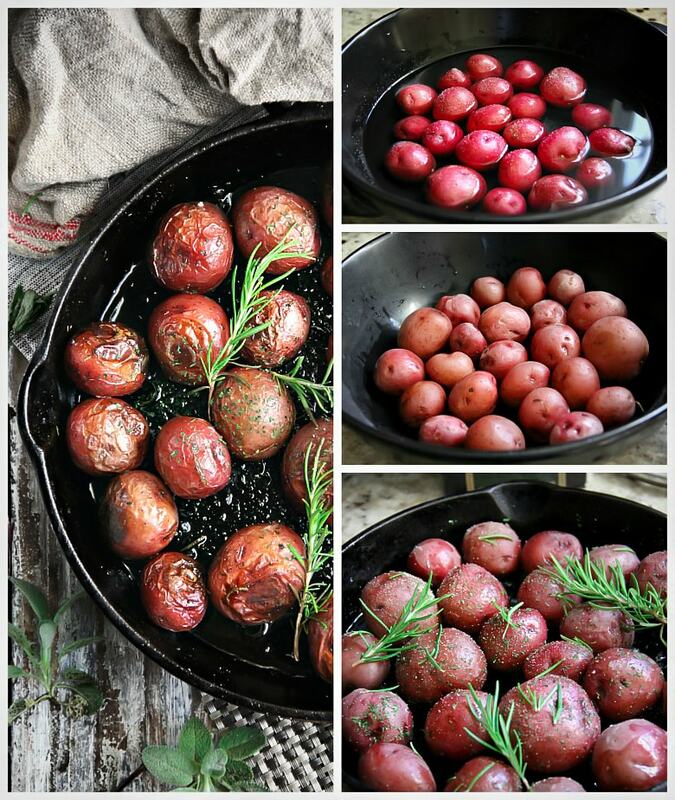 Just love these delightful potatoes that you could serve any day of the week or for a weekend cook-out. Boil 3 cups of water with a half tablespoon of salt and prewashed potatoes. Boil for about 15 minutes at high heat. After boiling the potatoes, drain out them and transfer the potatoes to a skillet, then spread out into 1 layer. Toss the potatoes with olive oil, black pepper, sea salt, rosemary and dried parsley. Bake for about 40 minutes or until the potatoes are somewhat golden and tender. If the fork goes through them easily then they are done. Make sure to turn them around with a spatula or similar at half time during cooking to assure even browning. You may add other herbs such as thyme. You can use medley potatoes, or any small or young potatoes for this dish or a mixture of all. For a bigger family, use more potatoes, just make sure that they are roasted in one layer. If you have any bacon drippings use it for this. You won't be sorry if you eat bacon, of course.